Almeida Restaurant & Bar is a fine addition to Islington’s vibrant neighbourhood restaurant scene. 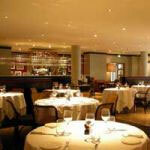 It offers modern light French food from Head Chef Alan Jones in a sophisticated but laid-back environment. Located just opposite the Almeida Theatre, this restaurant offers a variety of menus including pre and post theatre menus. There is also a relaxed wine bar where customers can pop in and enjoy many wines by the glass or pichet and an all day bar menu of nibbles and petits plats.